For over a decade, the Princeton Varsity Club has helped to bring Princeton varsity student-athletes, representing a variety of sports, to local elementary schools as part of “Reading with the Tigers.” As part of this multi-school annual event, Tiger student-athletes read to school children ranging from kindergarten to fifth grade. As part of the Reading with the Tigers program, the Princeton Varsity Club has formed partnerships with elementary schools in Trenton, including the Monument School (now closed) and most recently, the Christopher Columbus Elementary School. 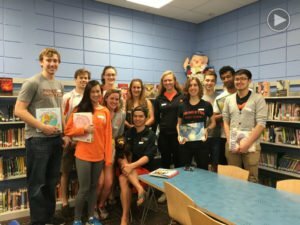 During the 2015-16 academic year, Reading with the Tigers expanded its programming through a partnership with the Office of Community and Regional Affairs, which brought Tiger student-athletes to all four Princeton Public School District Elementary Schools, including: Community Park Elementary School, Johnson Park Elementary School, Littlebrook Elementary School and Riverside Elementary School. Click here to view a video highlight of the most recent (April 29th) reading event at Littlebrook Elementary School. Reading with the Tigers kicked off this past spring semester with a Dr. Seuss themed reading event at Christopher Columbus Elementary School in advance of the March 2nd “Read Across America Day,” which coincides with the birthday of Dr. Seuss himself. Princeton student-athletes across a variety of sports visited select classrooms to read to the students, all while speaking to their experiences in grade school on up to their present-day Princeton environment. To view photos from the three spring “Reading with the Tigers” events, click here. The PVC would especially like to thank Franklin Templeton Investments and the NJ Best 529 College Savings Plan for their support of the Reading with the Tigers program.